I’ve been a fan of The Body Shop for as long as I can remember. We used to make frequent trips to the Bayshore Shopping Centre in Ottawa and it was one store that I knew we’d be checking out. My mom purchased their body products for herself and then I started buying them as a teen with money I made from my part-time job. 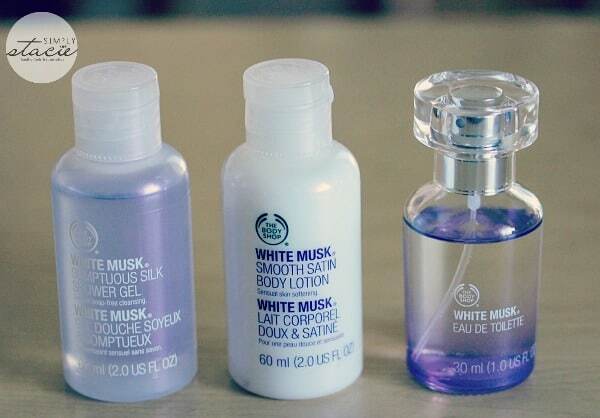 I was a fan of the White Musk fragrance and it was all I wore back then. I was sad to move away from The Body Shop and my beloved White Musk perfume. Now I don’t need to worry about the distance. Hello online shopping! The Body Shop has their largest gift selection ever this Christmas season. They have over 75 gifts that new and old fans will adore. If you’re stuck on a person and don’t know what to buy them, take a look at your local store or visit The Body Shop online. I’m sure you’ll be able to find a few items perfect for gift giving. To make this holiday season even more special, The Body Shop has teamed up with War Child, a global charity for children affected by war and grants these children the wish of education. They are aiming to provide more than six million lessons in war-torn areas of the world. You play a part in helping this initiative. For every gift you buy, no matter how big or small, The Body Shop will make a contribution that funds a class for a child. How awesome is that? Shop for Christmas and helps others. Sounds like a win-win. Today I want to share with you my top picks from The Body Shop gift selection. Of course, you knew that I would have to include something White Musk right? This set includes White Musk Sumptuous Shower Gel, White Musk Smooth Satin Body Lotion and my fave, White Musk Eau de Toilette. 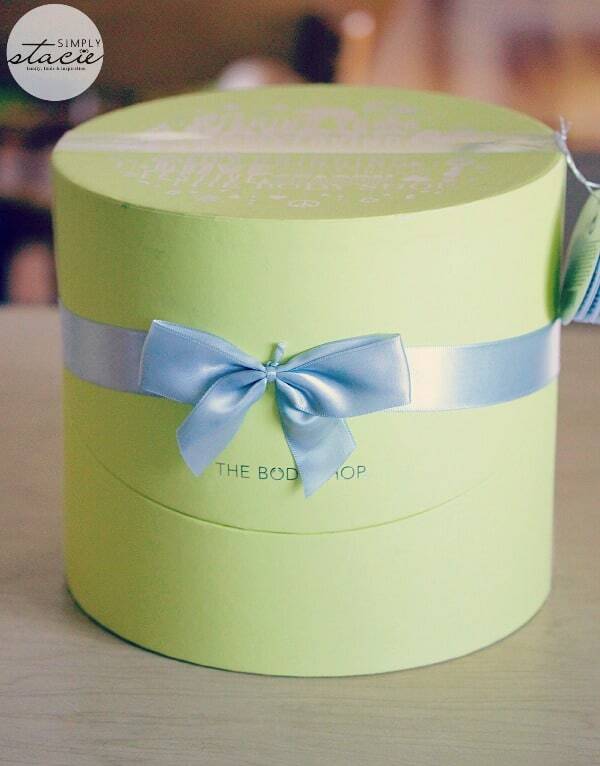 It comes packaged in a box ready for gifting. You could wrap it if you like or just leave as is under the tree. I received the small set which has an SRP of $20. They also have a Large set with an SRP of $35. It contains White Musk® Eau de Toilette 60 ml, White Musk® Eau de Toilette 10 ml, White Musk® Body Lotion 60 ml, White Musk® Shower Gel and a Mini Notebook. It smells so good! This scent brings back so many memories. I’m happy to start wearing it again. Get gorgeous with this pretty Autumn/Winter 2014 shades of eye shadow. 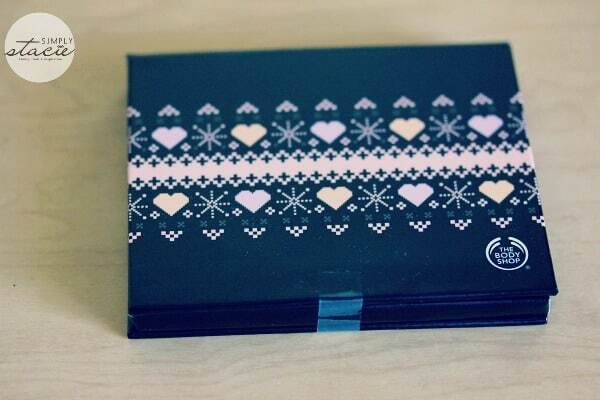 It comes packaged in a special edition Nordic Christmas design. It features four shimmering shades and a double-ended brush. My teenage daughter has been wearing the eyeshadow. It’s suitable for contact-lens wears like her. Her favourite is the soft purple colour. It has an SRP of $20. You can’t go wrong with some Body Butter. It makes for a great stocking stuffer! The Body Shop Body Butter is the bomb! Some moisturizers dry out my skin, but this stuff really does work. My hands feel soft, smooth and hydrated. I need to keep The Body Shop Body Butter close by with the dry, cold winter here. I tried Vanilla Brulee Body Butter and Frosted Cranberry Body Butter (so festive!). I buy a bunch at a time so I always have some around when I need it. They have an SRP of $20 for 200 ml. A trio of mini Body Butters in some fresh fruit flavours! 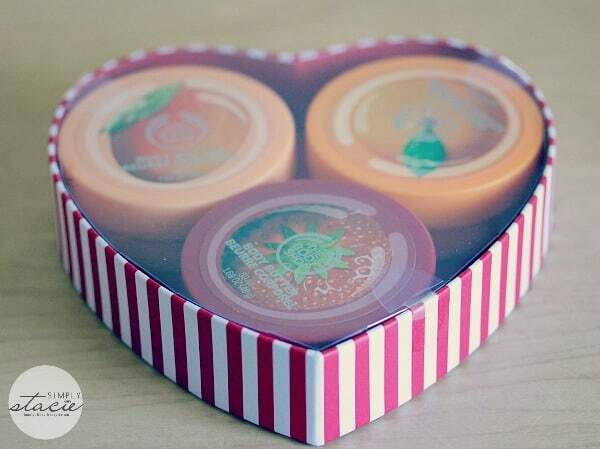 It includes 50 ml each of Strawberry Body Butter, Satsuma Body Butter and Mango Butter Body. It has an SRP of $14 ($18 total value). It’s packaged in a pretty heart shaped box ready to give to someone who has your heart. White Musk for Men is a sensual blend of musk, lavender, cedarwood, vetiver and amber notes and smells AMAZING! John and I can be known as the White Musk couple with him in his fragrance and me wearing mine. This set comes in a collectible tin and includes White Musk for Men Hair & Body Wash 200 ml, White Musk for Men Aftershave Balm 75 ml and White Musk for Men Eau de Toilette 100 ml. It has an SRP of $45 ($57 value). I may have to buy another one for my brother-in-law. I think he’d really like it. He’s a good looking guy who always has a neat, professional appearance. 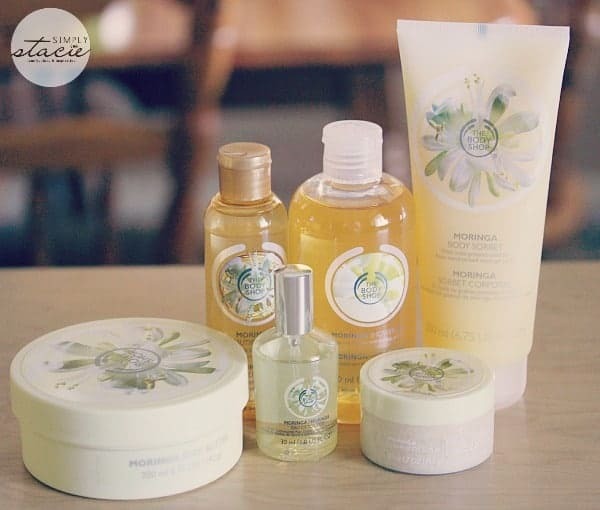 Moringa is a light, feminine floral scent and this collection is truly luxurious. It contains everything a person would need to keep skin looking and smelling fantastic. It definitely lives up to its name! It includes Moringa Shower Gel 250 ml, Moringa Body Butter 200 ml, Moringa Body Scrub 50 ml, Moringa Body Sorbet 200 ml, Moringa Beautifying Oil 100 ml, Moringa Eau de Toilette 30 ml. You can buy this set for $55 ($80 value). It is also available in Strawberry and Shea and Coconut. My sister Jillian saw this set in my home and was swooning over it. I guess she is a big Moringa fan! Use this handy store locator to find The Body Shop closest to you. If you don’t live near a store, don’t despair. You can order online. That is what I’ve been doing when I can’t make a trip to Ottawa. Don’t forget your purchase helps a charity – buy a gift, help a child! I’ll be picking up some of their gift sets for my family and friends. Connect with The Body Shop Canada on Facebook, Twitter, YouTube, Pinterest and Google+. 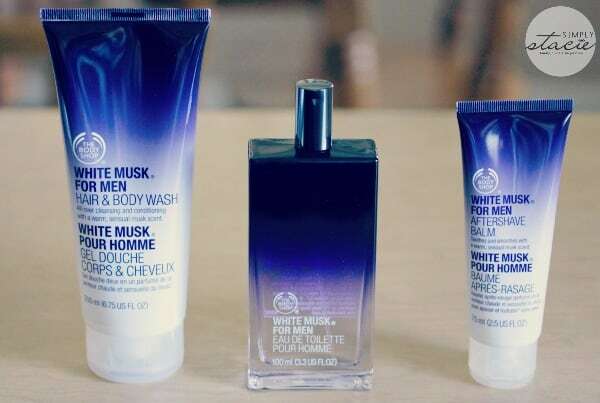 love White Musk myself and happy to see that they carry it in Men’s products. I think I would LOVE this. I never splurge on things for myself. I would like to get some of the men’s products for my boys. I love the Body Shop for all their wonderful products! The perfumes and lotions are awesome, and they smell so good. Someone in my family always gets me something their every year for Christmas. I can not wait to see what they surprised me with! I was just shopping earlier, and I completely forgot about the Body Shop! I’ll have to make second rounds because their products would make perfect stocking stuffers! The Body Shop is a great place to buy bath and body products, and bath and body products make great gifts. Thank you for sharing this review, it’s always great to help a child. I like their body butters. 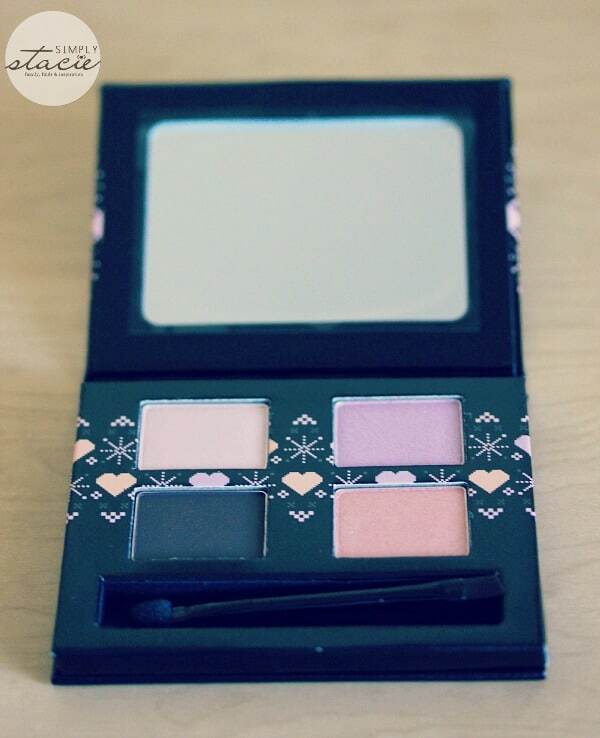 Nice looking eyeshadow. The Body Shops Body Butters are my favorite, they’re so nice to get as gifts!! Haven’t been to the Body Shop in a while, time to go back! I really like all of those products and maybe I’ll just have to get some for myself as well as for gifts! I love the Body Shop!!! I tend to go toward the fruit scents over the flowery ones. 75 gifts…how did you get out of there without being broke!!! 🙂 You can’t go wrong with body butter. It’s decadent and luxurious and just makes you feel pampered, especially when in fun scents. The Body Shop is always a great place to pick up gifts, love their Body Butters! 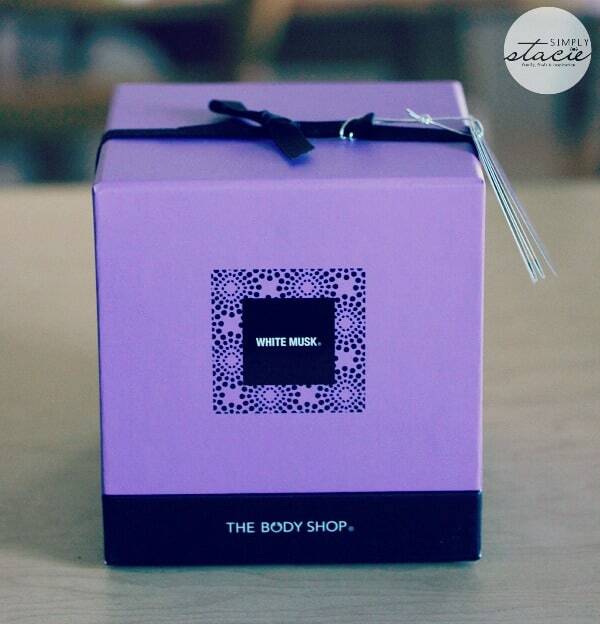 I’ve always loved The Body Shop products too. Awesome gift ideas, but I think I want the Moringa Ultimate Luxuries for myself! These all sound fabulous! I love the Body Shop. It is high quality and I know I can trust their products. They still make the White Musk scent…..good to know! These are great picks. The body shop and bath and body works are my go-to for gifts if I don’t know what to get a person! I absolutely love The Body Shop! I’d love receive any of it. With three girls in our house there is always some Body Shop products under the tree or in stockings! I have dry skin and in the winter it’s worse so I like their body butters. I’ve only been to The Body Shop a handful of times, I love how friendly the staff are and the amazing selections! Wish there was one closer so I can do in person more often.